This is the only wedding-related post I’ll ever write. Last Thursday, I huddled in a corner of our house and decided to pull together a wedding invitation-sending marathon. I was on envelope 22 of 57, singing along to Fiona Apple’s “Not About Love” and geeking out over how awesome my brand new Sharpie Pen was. Suddenly, I realized it was the first time since becoming engaged in December that I was actually having fun doing something wedding-related. And it’s all, sadly, because I was doing two things that I love doing in my everyday life: writing with nice pens and listening to good music. And I guess sticking labels and envelope seals and stamps everywhere was kind of fun, too, because hey, who doesn’t like stickers? I’m pretty sure Fiona Apple is not the artist of choice when it comes to choosing wedding invitation-stuffing accompaniments. In fact, she is basically the antithesis of anything lovey-dovey, happy or even mentally-sound. But that’s okay. It was my space, my time, and I could listen to anything I wanted, regardless of what the ‘proper’ soundtrack (and I’m sure some poor soul on TheKnot.com has created such a thing) for stuffing invitations is. And that basically sums up how I feel about my upcoming wedding ceremony and reception. I don’t like decorating. I’m way too cheap, I’m not crafty, and I have more trivial things to worry about, like what I’m going to get at Panera for lunch or why there have been three turkeys chilling in this person’s front yard the whole week I’ve driven by during my morning commute. I like things as simple as can be, and that’s exactly how I’ve planned our beachside wedding to be: no frills, just the basics. 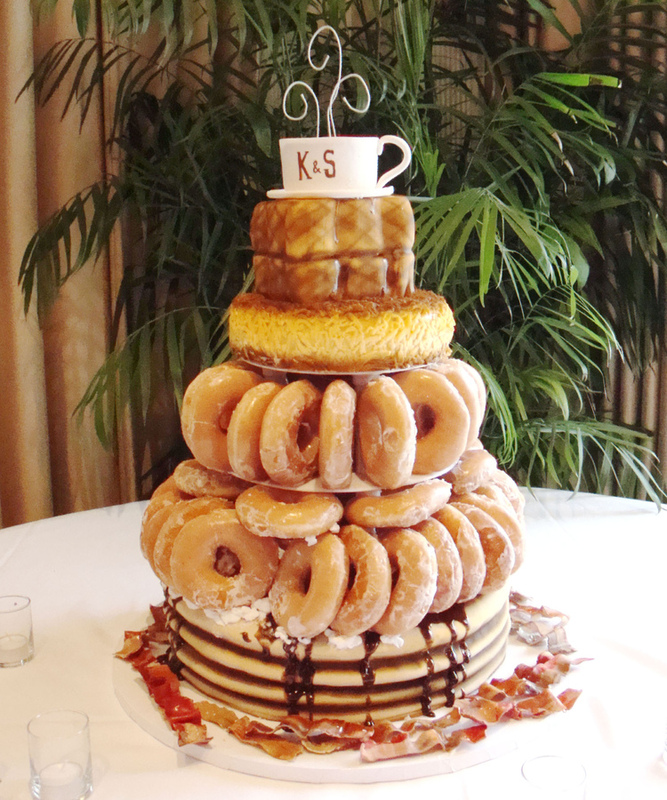 Okay, I lied — PERHAPS I would get excited over something as awesome as a tiered donut stand in lieu of a wedding cake. People have questioned why I’m being so simple about the ‘most important day of my life,’ but I want to know – is that really the truth these days, or is it a standard set by companies and the movie industry? Call me a feminist, but I wasn’t born with the end goal of being married – I was born with a desire to learn, to work hard, explore the world, raise kids one day and hopefully read some really awesome books along the way. Everyone has different goals and priorities, and I think it’s okay for me, and others, to admit that sometimes planning a big wedding just isn’t one of those things that you dream of like other girls do. When I was little, my big dream was to have an apartment and a cat of my own. I also had a desire to learn how to churn butter, but that’s probably because I was temporarily obsessed with the Little House on the Prairie books. I dreamed about being a published writer and learning a new language and going to college and joining a sorority. I don’t think I ever once played out a wedding scene with Barbies, but then again I wasn’t a big fan of them to begin with. I was too busy playing handheld electronic games and recording songs with my sisters. These dreams that we have when we are young, although sometimes silly, fuel our desires and goals when we get older. The more of them we accomplish, whether we end up truly liking them or not, the more fulfilled we feel. I guess this all leads up to my ultimate response when people ask how wedding planning is going: It’s going well, but it’s not something I can say I’m genuinely excited about because it just was never a dream of mine to begin with. For all the gung-ho brides-to-be out there, I applaud you for your eagerness to match color pallets, your willingness to spend hours crafting things that I probably could never make, your unwavering interest in bridal magazines and websites and your general excitement over what you have always dreamed of being the best day in the world. Your dreams were different than mine, but that doesn’t mean we are different – we both are getting married because we’ve found a person that we want to spend the rest of our lives with, and that, my future veil-adorned friends, is certainly worth walking down the aisle for. Previous Post Guard those precious LinkedIn connections! My take on the scathing emails from Kelly Blazek. So glad I stumbled upon this post. Have to admit, the donut cake was what drew me in (who can pass up a donut cake?!) but your post really resonated with me. I just got married last year and I was exactly the same way…I was absolutely not into the thrills and frills of the normal modern day wedding either. I’m glad you’ll be celebrating your special day in a way that is meaningful to you. I’m glad to hear there’s someone else out there who feels/felt the same way. Weddings are WAY too crazy these days, and it doesn’t mean we have to give in. Thank you for stopping by!